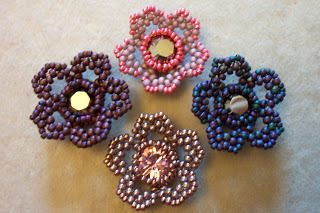 Beads By Becs: Friday Flower Freebie! Yesterday was Friday… and I was struck by some inspiration after work on how to make a herringbone bezel for a chaton, and turn it into a flower. I’m in a generous mood too, so I thought I’d write it up on here as a free pattern, rather than put it up for sale in my Etsy store. There are plenty of other patterns/tutorials in my Etsy store if you feel like having a look though! Do you love herringbone stitch as much as I do? Really, there’s so much you can do with it — whether you want to make a beaded bezel for a crystal bead, a beautiful twisted herringbone rope, or a piece of beaded jewelry with a distinctly African ethnic feel, herringbone stitch is my go-to bead-weaving technique for creating unique jewelry. 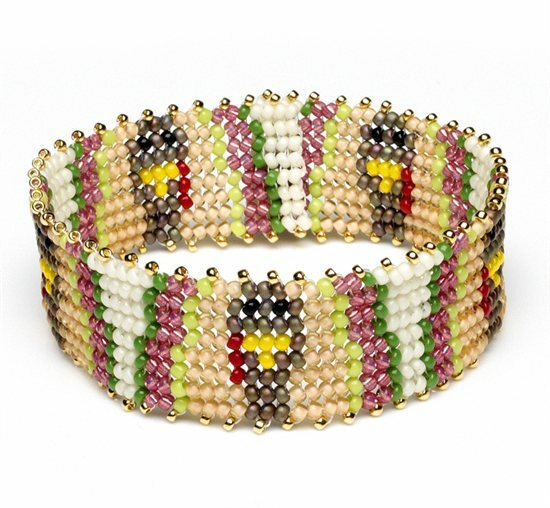 Stitch up this adorable herringbone turkey bracelet, just in time for our annual day of gratitude and feasting. If you’re a pro at working in herringbone stitch, you probably only need to look at the pattern at the bottom of this page to get going. If you’re new to herringbone stitch, follow these instructions. While I was trying to come up with a necklace strap for a wonderful, bold tribal pendant, I realized that making a textured herringbone rope using these striped seed beads was perfect. The colors and texture of the seed beads and the herringbone rope accented the pendant without overpowering it, and because the seed beads are so large, the herringbone rope works up fast. Give it a try! 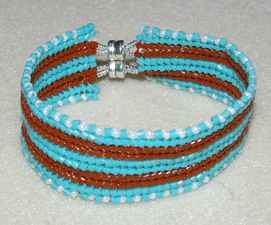 Want more great tubular and circular peyote-stitch projects? I discovered a way to combine a little bit of herringbone stitch with a lot of peyote stitch to create easy, fun-shaped peyote-stitch bezels for these little gems! Here’s a quick rundown on how to make a peyote-stitch bezel for a triangle cabochon. Herringbone and Ndebele stitch, basic instruction for flat and tubular, animated. Produced and narrated by Ann Benson of beadseast.com.